This 1726 English sampler was completed by Ann Wright at 9 years of age. 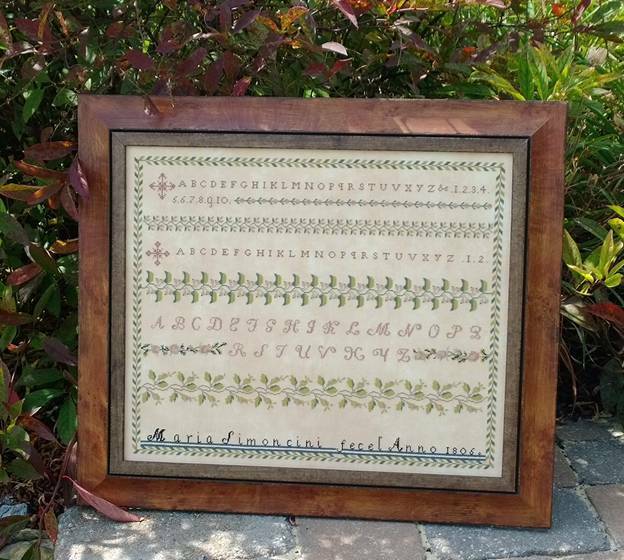 The sampler is mainly Cross Stitch but contains some Eyelet, Satin, Bergello, and French Knots. This is one of my all time favorite samplers. There is no name, just the initials BG, and the year 1874. 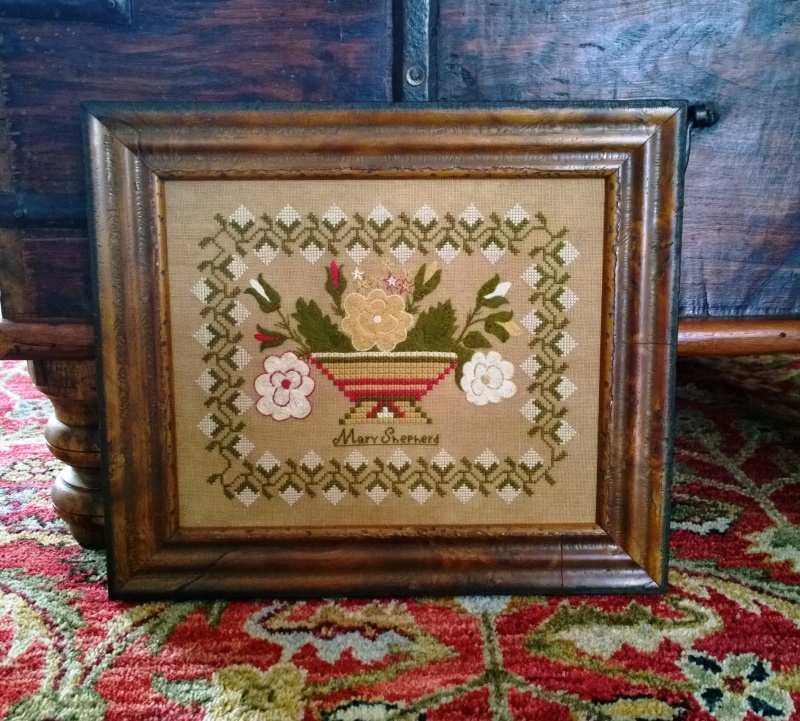 I believe it to be an English sampler. Although very fragile the original is in fairly good condition (the original is pictured). 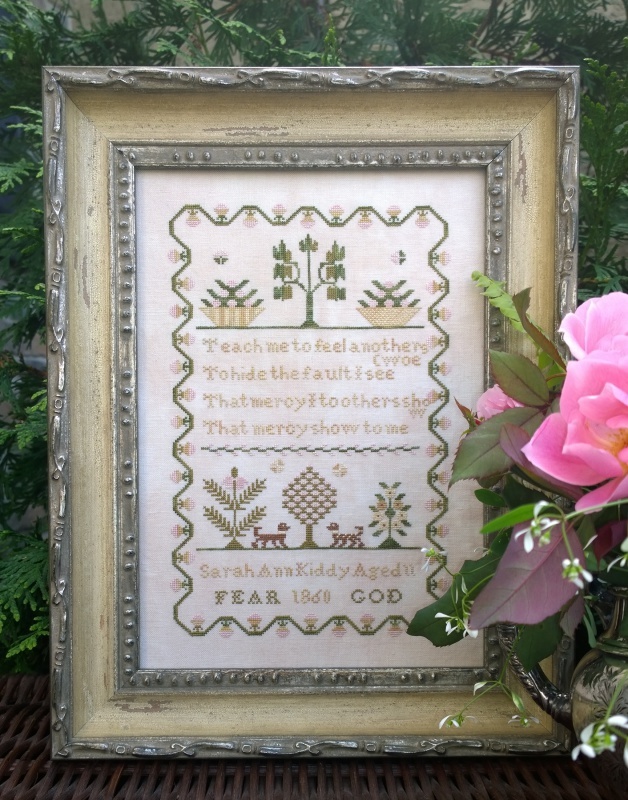 To love and serve my God"
Sarah stitched this piece when she was 12 years old. My parents Love to me"
Such a sweet sampler, I love the little verse. 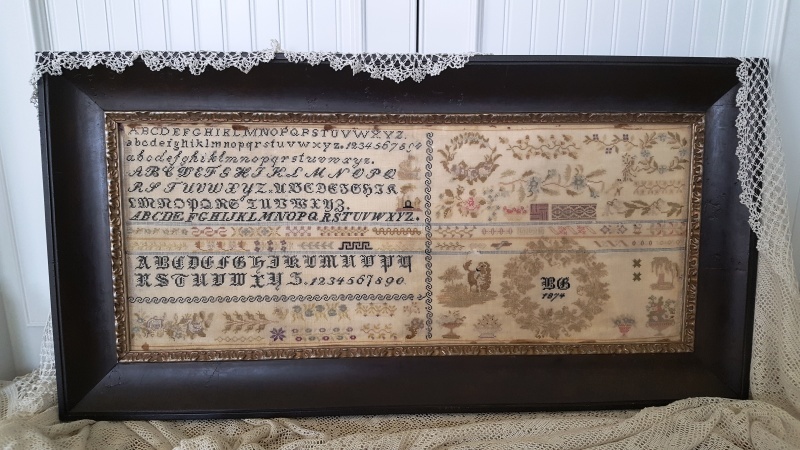 This sampler was brought to me by Stephanie Jirak of Lincoln University, PA. She is the Great Great Great Granddaughter of Nancy Anne Cassell. The family history is included in the chart. 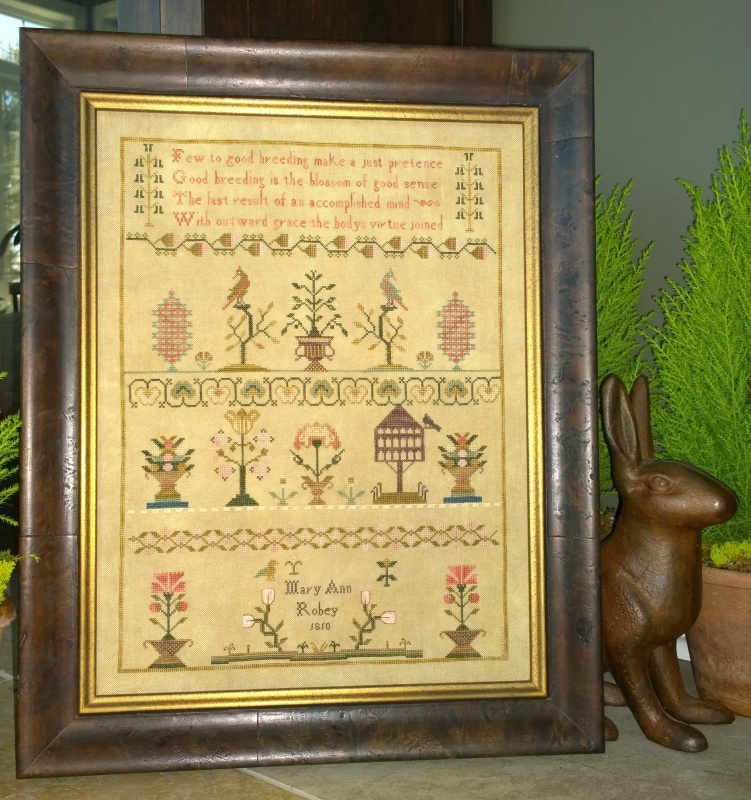 With outward grace the bodys virtue joined"
I love the bands and motifs Mary Ann used in this sampler. The colors in this sampler are beautiful... the mix of blue and coral is outstanding. 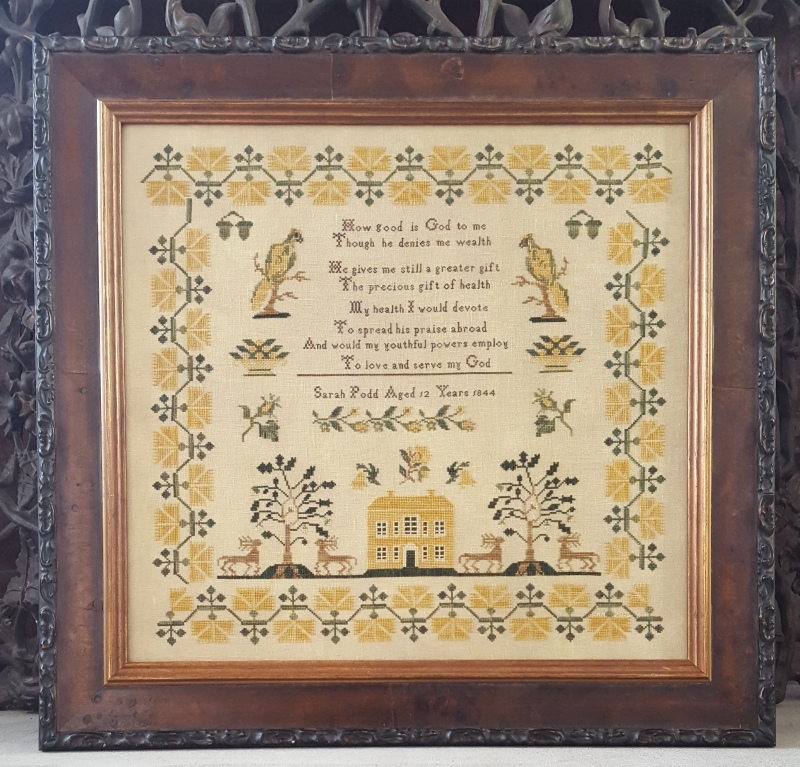 The saying on this sampler was written by Alexander Pope (1688-1744) who is considered to be one of the greatest English poets of the 18th century. 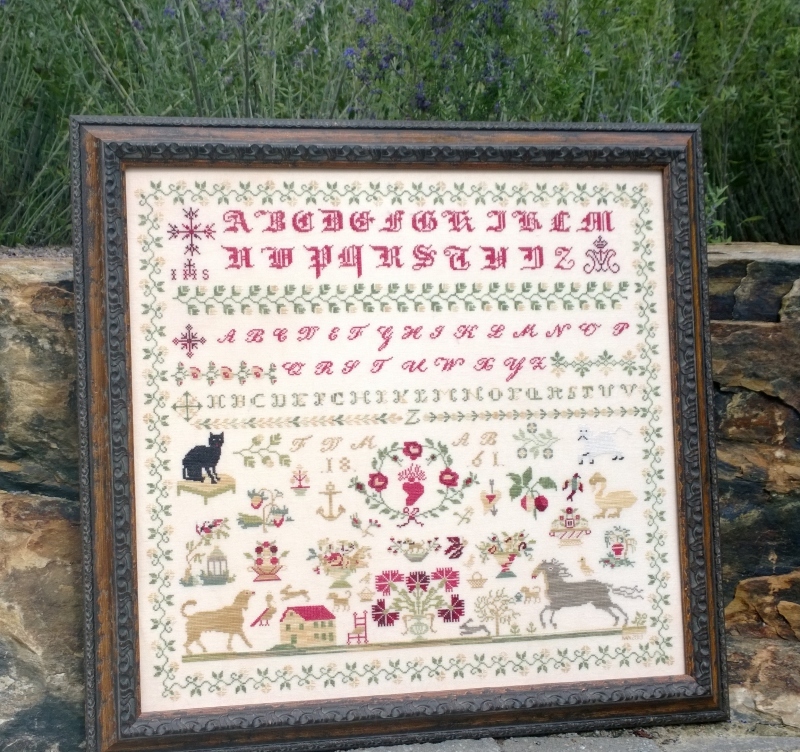 Sarah stitched this sampler on 50 + count linen and it was perfectly executed. 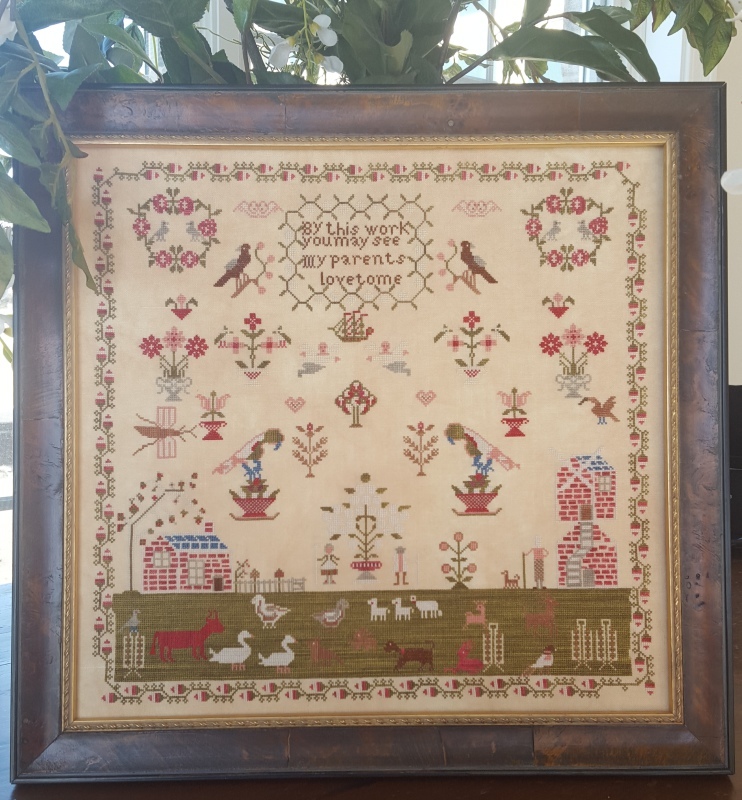 Not only do I love the colors Agness used to stitch her sampler but I love how she ran out of room to stitch the date 1844 so she moved the last 4 up to another line. And write thy name thyself upon her heart"
The vibrant colors and wonderful animals including a zebra and peacocks make it very unique. I particularly like the sky and clouds. Mary is a very fun piece to stitch. The floweres and leaves are filled in with Stem Stitch and the basket is stitched in two layers. 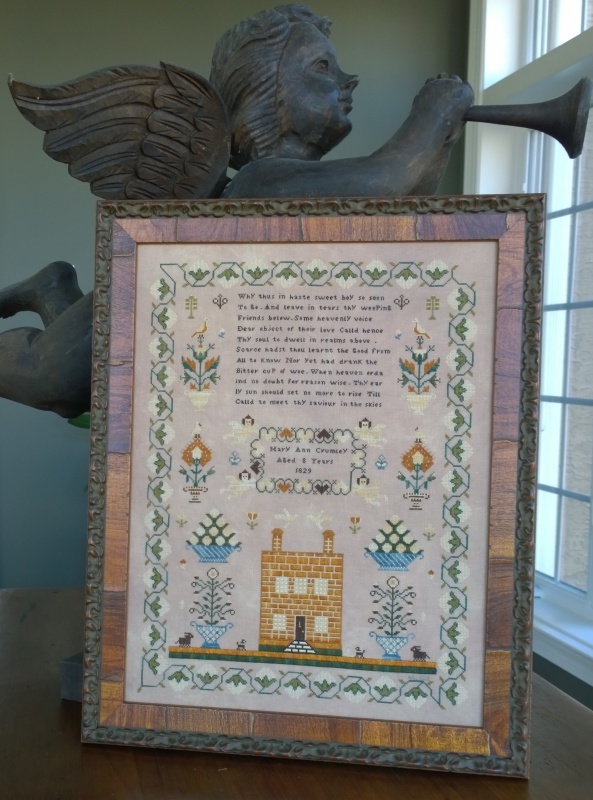 Calld to meet thy savior in the skies"
Loved stitching the Satin Stitch bricks on the house! I love the simplicity of this little sampler. Eliza was 10 years old when she completed her sampler and beautifully hem stitched the edges. Maria is a personal favorite. Her design and colors are peaceful and very relaxing to stitch. The floral bands are beautiful. 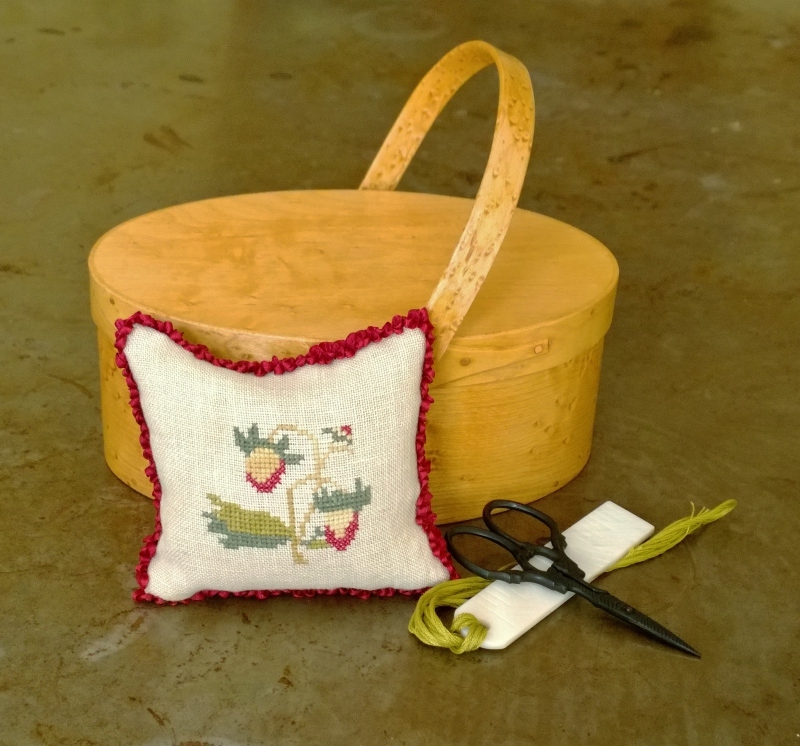 This pincushion was stitched using a motif from an 1861 sampler. When stitched over 2 threads on 35 count linen it measures approximately 4 inches. This sampler has no name on it so I lovlingly, refer to it as the Black Cat sampler. I believe the original was crafted in England. 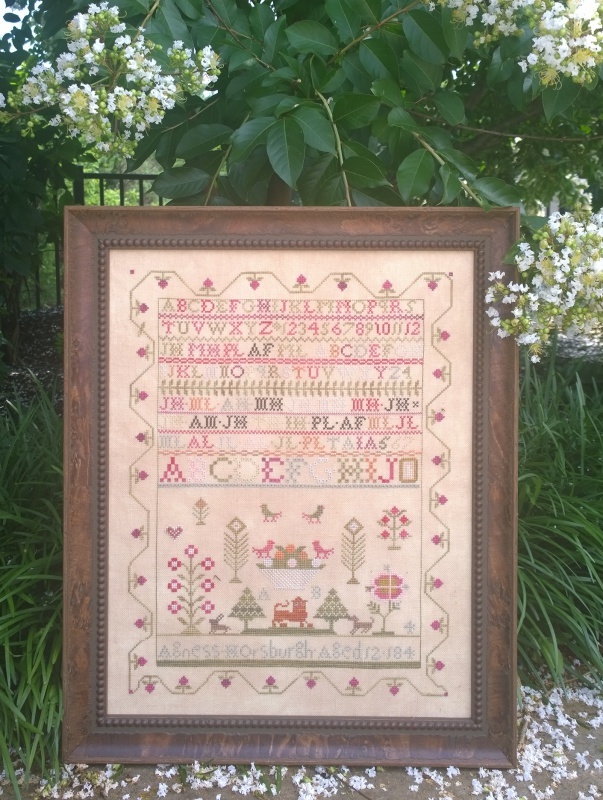 There are two sets of initials on the sampler but I have not been able to determine if they are that of the stitchers. What a stunning English sampler! It was so much fun to stitch with all the motifs and bright colors. Not sure if the swans, bull, or parrot is my favorite... okay, maybe the red house? 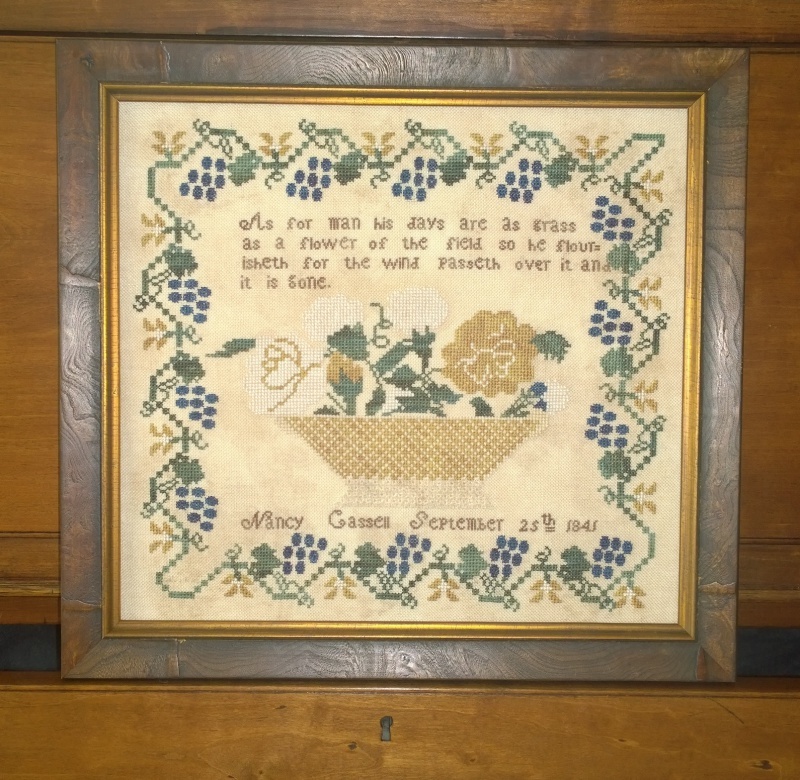 With all its beauty on"
This sampler is dated December 24, 1834. 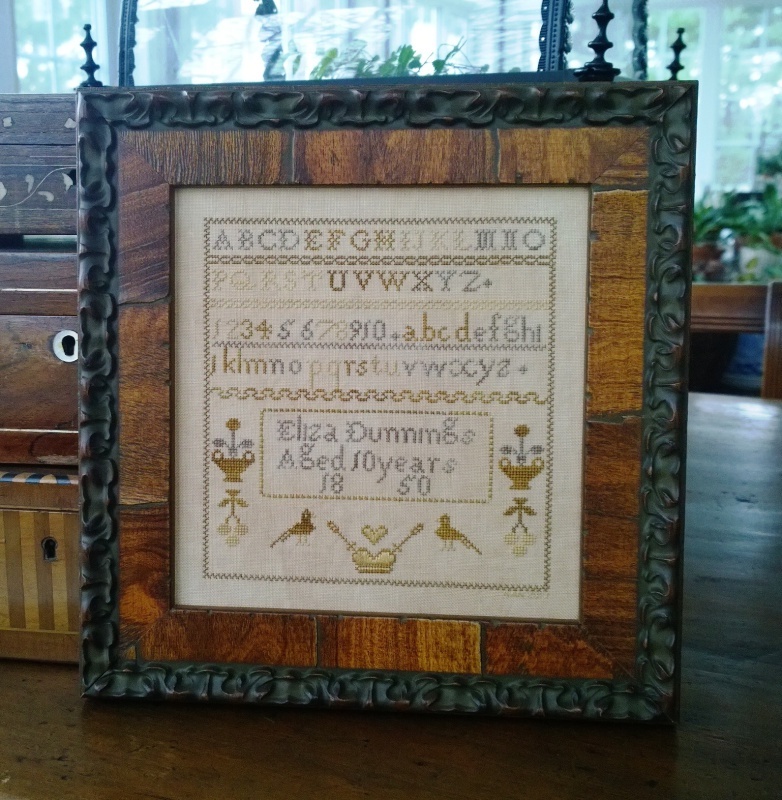 I was told this sampler was a Christmas gift to Louisa's parents. Louisa was 9 years old when she completed this brightly colored beauty. 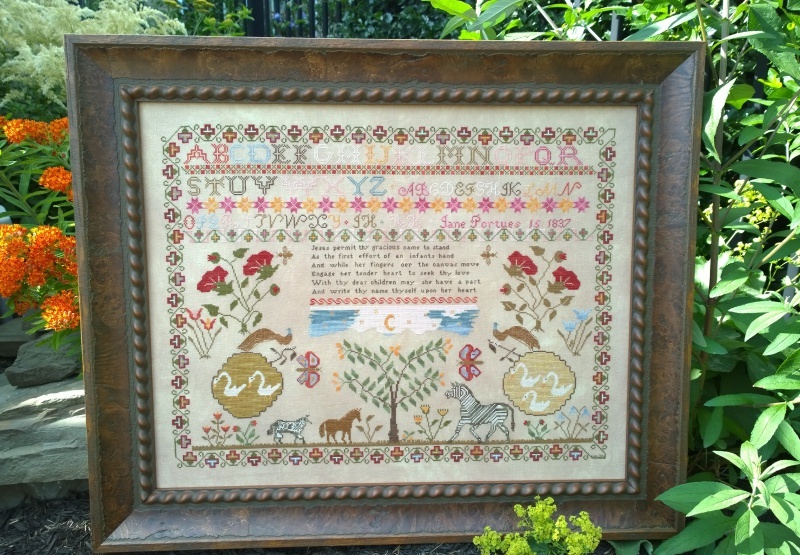 but a heaven our care should be"
Yes, this sampler is large... but such a joy to stitch. 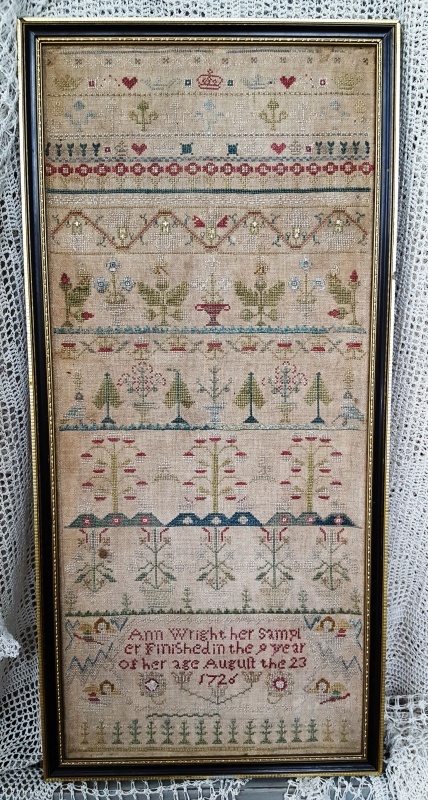 this is a stunning English sampler from 1803 done in muted colors.